A family featured in photos taken in Aberdeen many decades ago which were found in an Australian supermarket trolley has been identified. An international appeal for information was launched after the find was made at Woolworths in Woodcroft in Adelaide. They are from the 1940s, 50s and 60s in Aberdeen and the north east of Scotland. They have not yet been claimed by the owner. 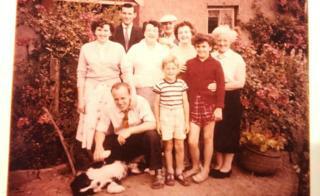 Kenny Riddoch, from Fife, was amazed to recognise himself and relatives. Supermarket manager Anna Christopoulos started her search after a colleague found the box of dozens of photos on 22 March. With no claim made, she decided to share the pictures online in the hope someone would recognise them. Mr Riddoch, 66, from Cupar, contacted her, and now hopes the mystery can be solved. He told BBC Scotland: "It was really quite strange. About a year ago I joined a Facebook group called Old Finzean (in Aberdeenshire) Photos in the hope of finding photos of old holidays we used to have in the 1950s. It was a golden age, a special time. "That drew a blank and I thought that was an end of things. "Then on Saturday another member of the group sent me a message saying have you seen these photos so I had a look online and it was the most weird experience ever, to see photographs on an Australian TV station showing, me, my brother, my mum and dad, my grandparents from 60 years ago. "It was emotional. It's incredible." He explained: "My uncle Billy went to Australia in the mid-50s, he never returned to Scotland and we think died about 2005. We're guessing that they may have been his. But where they have been since he died we don't know. "I contacted Anna who took charge of the photographs when they were found, that led to her contacting you (BBC Scotland) again and you contacted me." Mr Riddoch said: "They're not our photographs, they're someone in Australia's photographs, our wish would be that person came forward. "If that person came forward we would perhaps find another member of our family that we don't know of. "If that fails we would love to have the photographs sent home to Scotland." "It's amazing to see how these sentimental photographs bring so much happiness and wonderful memories for the family. I wish them all the very best."